LIGHT Always wins out the Dark! Life is inherently complicated, and sometimes it’s easy to get into your groove and forget that it’s still a daily struggle. Over the past few weeks I’ve seen various topics that have sparked my interest, and I wanted to get in on the conversation. As many of you may know, this past week there was yet another Mass shooting. It feels like yet another cognitive distortion. Before Sandy Hook, we probably thought that no one would go into a school and deliberately kill young innocent children. History has thought us that we were wrong about that. For me there’s always been this type of respect for the sanctuary that is a church, at least hear in the United States. That it takes a certain kind of vile hatred to intentionally harm those at worship. Regardless of what our Race relations look like today, there’s just a kind of un-spoke rule. That at least in your place of worship you’re free from that type of persecution. I too was wrong, hate doesn’t have boundaries. Hate is so vile it will cross any boundary to get it’s point across. I must admit that because I haven’t directly experienced any kind of overt racism, I sometimes like to pretend that it’s not as serious a problem as some may make it. While I recognize that as a black male I have to be a bit cognizant, in recognizing that I could be the victim of racism. That people will and are judging me based on the color of my skin. I always find myself evaluating my own blackness. What does it mean to be black? Does my skin color mean I’m predestined to act a certain way? That I’m inherently more dangerous than some people? That I’m some how a lesser educated and unambitious person that the rest? These are questions I ask myself often, but I don’t get bogged down by the answers. I’m more focused on writing my own story and not letting society or even the color of my skin dictate who I’m to be. I’d never really thought about this before but race isn’t a genetic construct, it’s a social construct designed to help put people into broad easily recognizable categories. It’s not something necessarily designed by nature. While your DNA can tell you where you’re ancestral background has likely roots (Europe, Asia, Africa…) There is no exact biological way to determine a person’s race. This is such a surprising finding, because you hear about forensics determining the race and gender of a victim. The reality is that their answers are just statistical approximations. Yet we place so much emphasis on a person’s race. Interestingly even for siblings who grew up in the same household, it doesn’t mean that they will have the same personalities. If we’re not guaranteed to have the same personality of people we’re directly genetically related to. Then why is it acceptable to believe that we will share similarities to those we’re not genetically related to? These attributes make the concept of race so interesting yet unnerving. The color of my skin doesn’t tell you much about me, just as you can sometimes never tell who your siblings are. The tragedy in Charleston, SC has forced me to re-evaluate my understanding of the presence of racism in today’s world. There are many still alive today who went through the racial turmoil of the 1960s era. So the concept of racism isn’t that far removed from my lifetime. I think for us to not acknowledge that is dangerous. By remembering the past and our mistakes, we keep a constant reminder of our capacity for darkness and hatred. If we pretend that racism doesn’t exist anymore, we’re doomed to repeat the mistakes of the past. Science has show that we ALL posses an unconscious bias, that is part of the way our brain processes information. We must remember that just a few decades ago our government was the perpetrators of injustice. I don’t say this to be offensive, but rather to show how deep hatred and racism can go if unchecked. While we live in a society where our government isn’t usually the sponsors of racial attitudes, it’s not that far in our past that it has been eradicated. I’m happy to see the outpouring of love from the community in Charleston, which is much different from the riots and the violence that we’ve seen in others that were faced with injustice. There are many aspects of love, one of which is forgiveness for wrongs. Loving someone doesn’t mean that you won’t be angry or upset when they’ve wronged you. Loving someone doesn’t mean that you won’t set boundaries to ensure you’re not taken advantage of. I think many people get the concept of love wrong. I’ll acknowledge that I’m also continuing to evolve in my own views. I would like to encourage ALL who read this to take a stand towards injustice. Without your voice hate will continue to thrive. Have you ever notice what happens when you light a candle in the dark? 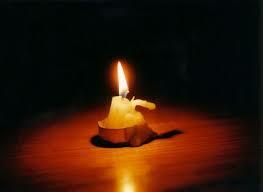 How the light seems to dispel the dark, that no matter how small the light, it can illuminate even the darkest space. How the light seem to bring a kind of peace to any situation. So I encourage everyone to let YOUR light shine in the dark spaces, to let LOVE win over hate. Hey there, good to hear from you. Personally, I hate even using the term “race”. I’ve always thought of us as all belonging to the human race, so by that definition we are all part of the same race. We may have different ethnic backgrounds, but to me ethnicity has always be more about social and cultural norms than anything else. It’s interesting – racism today is largely in terms of skin color, or visible differences. My grandmother was an immigrant who settled in a largely “Caucasian” city. But she suffered racism from people who looked the same, and just had different cultural norms. To me racism is largely ignorance and fear of the unknown. Maybe more exposure to different cultures could help reduce that ignorance, and reduce the fear with it.